Many of Tennessee's most beautiful falls are sprinkled throughout the Smokies, with a few must-sees southwest of the Great Smoky Mountains National Park. What you might not know, though, is that the largest, tallest, and perhaps even most beloved falls in Tennessee aren't found in the eastern wing of the Volunteer State (though that region certainly has some beauties to behold). Instead, those superlatives belong to the waterfalls of the Cumberland Plateau. And while Knoxvillians might have to venture a little bit west to see them, we promise the trip will be well worth it. 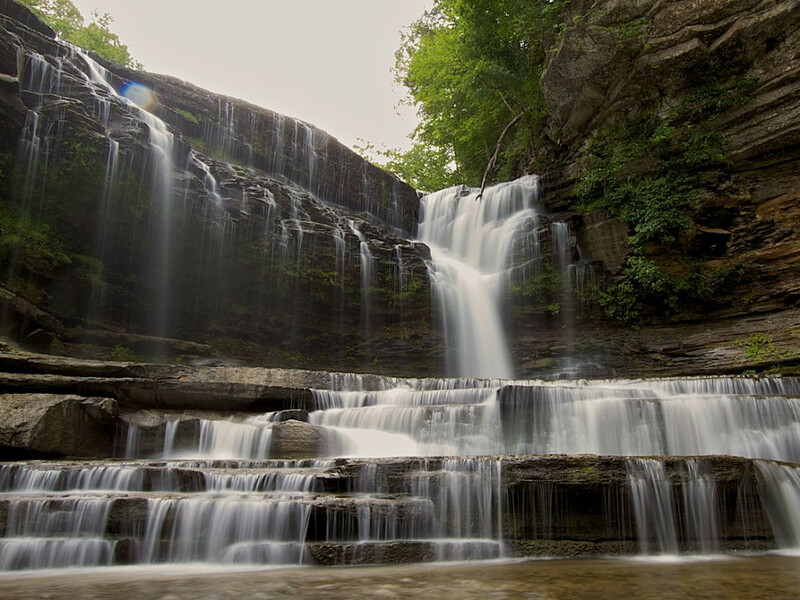 Here, a look at some of the best waterfalls in middle Tennessee. 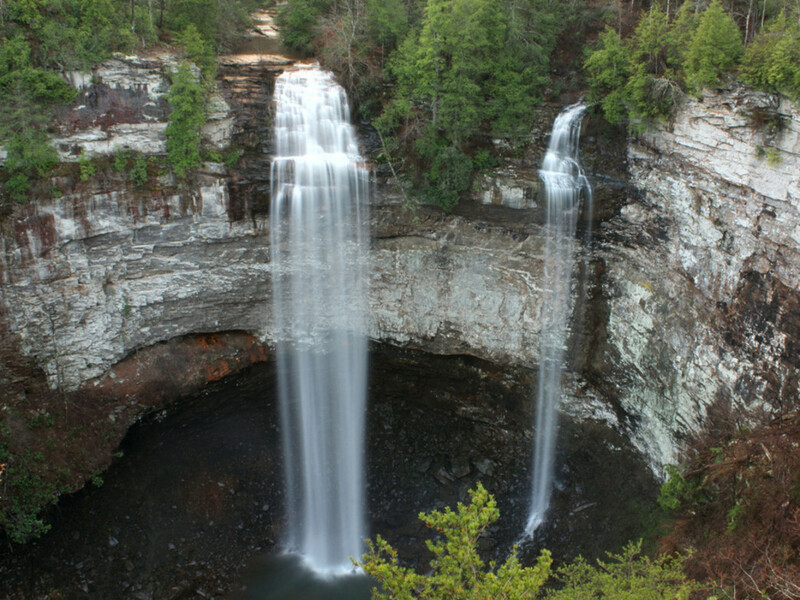 Cummins Falls is one of Tennessee's most popular, most visited, and most photographed natural phenomenons. It regularly makes top 10 lists for its numerous, otherworldly cascades and icy plunging pools. However, this state treasure was almost a state tragedy. Back in 2011, a disturbing development proposal suggested the building of 80 riverfront homes along the high bluffs that have guarded the falls for centuries. At the time, the falls were privately owned, unprotected, and were kept secret from most Tennesseans. But with the help of the state and generous private investors, this once hidden treasure is now protected with its own state park—and you can visit any time. A roundtrip, semi-strenuous, 2.5-mile hike will bring you to a beautiful overlook of the falls, followed by a 200-foot switchback descent to the river and Olympic-size swimming hole at the bottom. Go for a swim, climb along the rocks, or just relax on the edge and bask in the sun and the spray. 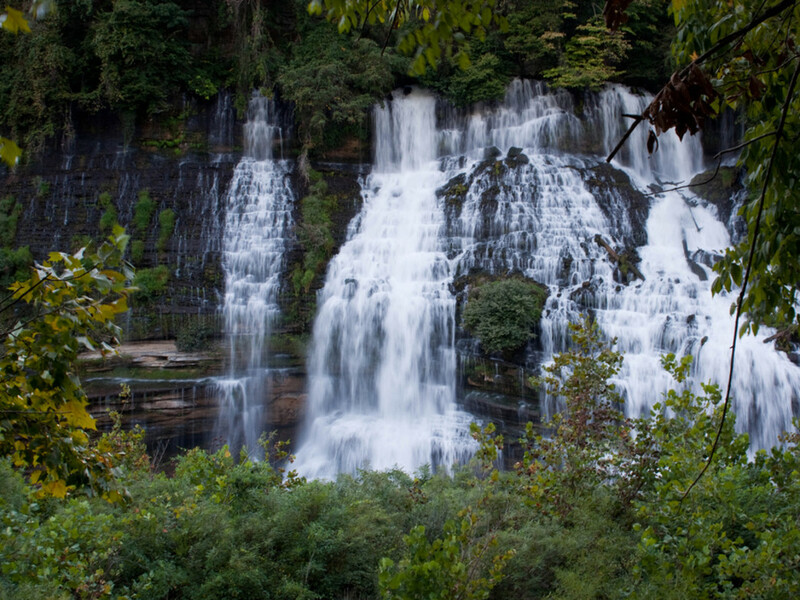 Beautiful Burgess Falls consists of four waterfalls that plummet down over a total of 250 feet. The 1.5-mile hike isn't very tough, which means you might be sharing the falls with quite a few people on busy weekends. The hike includes increasingly wow-worthy cascade views that culminate in the stunning 136-foot main falls. If you're looking to linger at Burgess, picnic areas, grills, and playgrounds can be found close by. Portions of access to the trail were damaged by flooding last year. Currently, the metal staircase and trail to the base of the main falls as well as the main falls and middle falls overlook are closed (repairs are scheduled to begin in spring 2016). Visitors to the park can still view the cascades, upper falls, and middle falls. If you want a waterfall retreat that's never too crowded, Rock Island might just be your one-stop-shop. Popular among paddlers, this small park packs a powerful punch of rugged beauty. More than 10 waterfalls are sprinkled throughout the region; you could easily spend a weekend trying to hunt them all down, but the best crowd pleasers are Twin Falls and Great Falls. Thirty-foot Great Falls is a horseshoe-shaped waterfall next to the 100-year-old cotton mill it once powered. Twin Falls spills out from an underground cavern 80 feet down into Caney Fork. Camping is ample here, or you can go a little more posh and spend a night in one of the park's comfortable cabins. 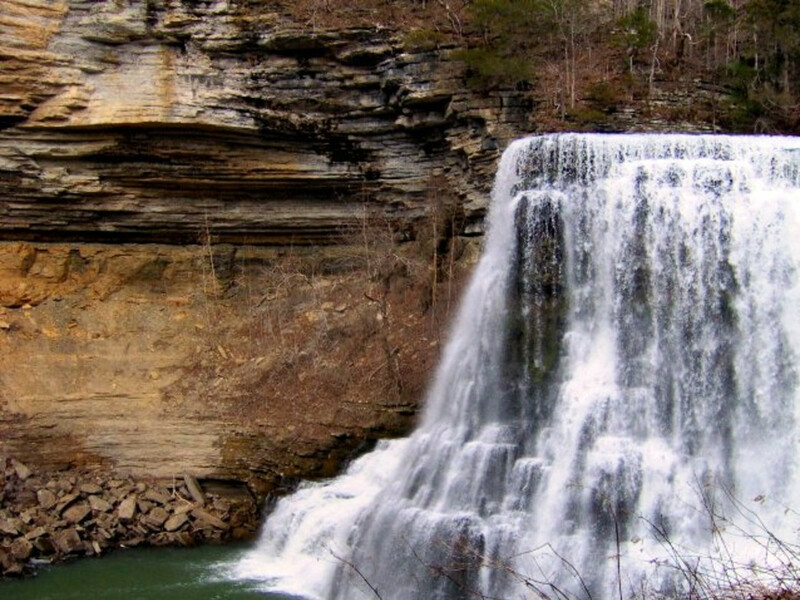 A primer on the best waterfalls in middle Tennessee waterfalls wouldn't be complete without a look at the tallest, largest waterfall in the state. 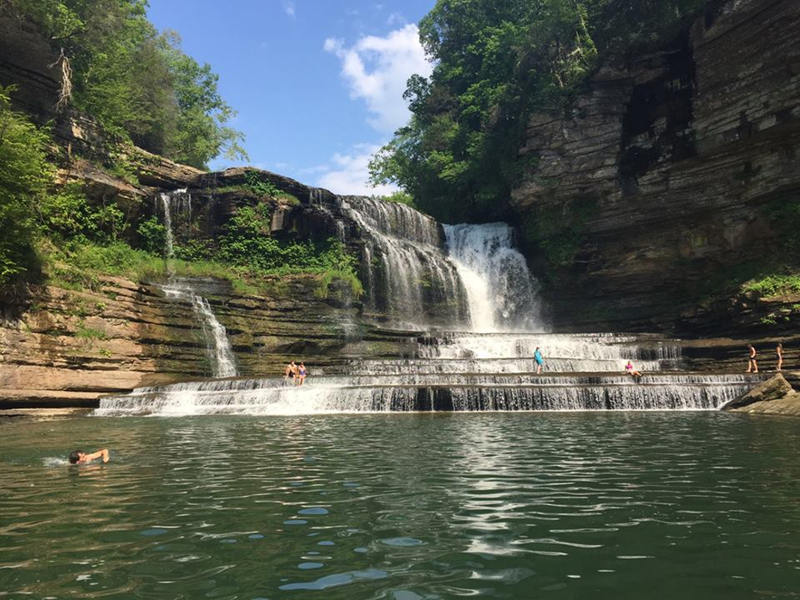 Described as the best park in the Southeast by Southern Living magazine , Fall Creek Falls State Park is home to 25,000 acres and 35 miles of trails. The park's namesake is a 256-foot cascade—one of the tallest east of the Rockies—and is just one of several waterfalls you'll find here. Whether you're looking for a short day trip or a longer backcountry excursion, this park is dressed to impress with tunnels of rhododendron, pristine streams, and transportive hardwood forests.